Greg Lyons was the face of well-known tractor brand, John Deere in Marlborough, working as Sales Manager in the Blenheim branch, South Island group. Greg has worked with many local farmers from viticulture to dairy, pastoral and lifestyle, and knows the wider Marlborough region well. With 25 years’ sales experience in tractors and machinery, Greg applies his personal philosophy of integrity and honesty, which has stood him well with anyone that has done business with him previously, and this now applies to real estate. 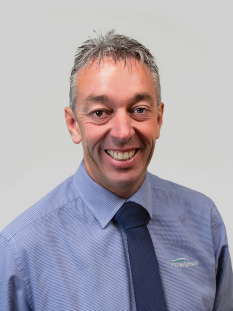 Greg has drive and passion, combined with proven sales results, and applies his relevant farming knowledge to his real estate career with PGG Wrightson Real Estate in Marlborough. Outside of work, Greg and Deb have a family of three teenage children, who are active in many sports, continually representing Marlborough at representative level in tennis, touch and football. Greg has also spent several years as a school board of trustees member and is active in many other community activities.